TMNT Entity: Mutant Turtles Gaiden chapter 4 reviewed! Mutant Turtles Gaiden chapter 4 reviewed! I conclude my series of reviews of Hiroshi Kanno's Mutant Turtles Gaiden manga for Adventures in Poor Taste with this fourth installment. And as it happens, Chapter 4 is the best one in the series. 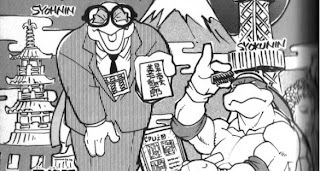 Mutant Turtles Gaiden chapter 4: "Discover Japan" reviewed. Full of self-awareness, hilarious cultural satire and some creepy fanservice, it ends the woefully short series on a definite high note. "Imagine being a Japanese kid watching TMNT every Saturday morning and seeing everything about your country routinely mangled. You’d probably end up thinking, “What the HELL, man!? Is that supposed to be US! 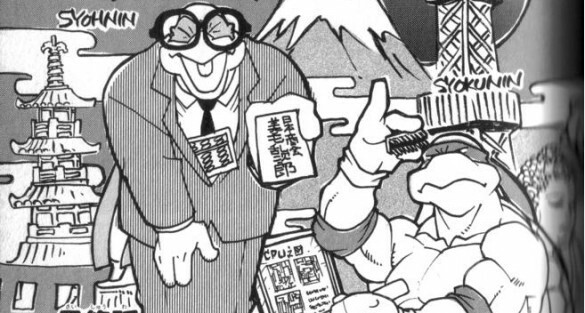 ?” This issue’s pretty much a commentary on how lazy the folks putting together the TMNT cartoon were; the extent of their research in Japanese culture and society beginning and ending at those WWII era Popeye cartoons they half-remember from their childhood. And Hell, who am I to point fingers? I can’t tell Asians apart, either. (Editor: That hurts, Mark.)" It's clear you were being wonderfully snarky (and correct) in that paragraph. So, I assume the editor got the in-joke of your final sentence whenever you posted it, or he or she was being a tad serious with that little edit? (I'm also assuming they have to read what you write before you post, or do you just post at your discretion?) Just asking for curiosity's sake (and text being such a funny thing when it comes to sarcasm). Also, are you ever planning to write an essay about the Fred Wolf series' "treatment" of Japanese culture? I've been meaning to ask you that for the longest time. It would be a wonderful read, I'm sure. As for the issue, nothing I can add, other than with Shredder ordering April, er, I mean, Irma to destroy the Turtles, and how casual racism swings both ways. Okay, then. And man, does Manga!Irma have big lips or uses way too much lipstick. Oh, well. Looking forward to your completion of the City At War arc. Naw, Russ was got the joke. He does in fact read my stuff, though he rarely makes edits save for a spellcheck (though he sometimes misses a typeo here or there). I think this was the first time he inserted an editor's not, though as the author, I thought it was a pretty funny insert. An essay on the Fred Wolf toon's treatment of Japanese culture? I could take a swing at it after I've gone further in my episode reviews (plan to pick those back up in another week after my next Spider-Man Clone Saga article). The series was mostly just ignorant of Japanese culture, such as thinking "Saki" was a last name (a mistake the 4Kids show was guilty of, too). On a few ocassions I was surprised that they got some cultural details right (an episode that flashed back to Shredder in high school actually had him wearing a traditional Japanese high school uniform), but I think the article would mostly just consist of pointing out poor research and cultural stereotyping. I figured he got the joke and it was funny, but I was just curious about the behind-the-scenes aspects, as cold text and sarcasm.... You get the idea. As the essay, you got plenty on your plate already, as I was merely making a suggestion. If asked, I'd much rather you finally write commentary on why you think Slash is so insanely popular, as you once mentioned in passing. And, yes, sometimes, the Fred Wolf series did get details right, like "Legend of Koji" finally used Oroku as the surname, plus the high school uniform you mentioned. (I think that was in the "Shredderville" episode, or so I can recall, at the moment.) Like so many things in the 80's/90's animation, "the only thing consistent is the inconsistency." And I forgot how the 4Kids series did the "Saki as surname" issue, as well. And in hindsight, you're right as "I think the article would mostly just consist of pointing out poor research and cultural stereotyping." So, instead, you could easily expand your scope for the whole franchise for a more well-balanced look. I should have thought of that before I asked. Oh, well. As for your Spider-Man Clone Saga article, I'll definitely give that a look.